Live rock is rock from the ocean that has been introduced into a saltwater aquarium. Along with live sand, it confers to the closed marine system multiple benefits desired by the saltwater aquarium hobbyist. The name sometimes leads to misunderstandings, as the "live rock" itself is not actually alive, but is made simply from the aragonite skeletons of long dead corals, or other calcareous organisms, which in the ocean form the majority of coral reefs. When taken from the ocean it is usually encrusted with coralline algae and inhabited by a multitude of marine organisms. The many forms of micro and macroscopic marine life that live on and inside of the rock, which acts as an ideal habitat, give it the name "live rock". Live rock is harvested for use in the aquarium trade from collections in the wild near reefs, where parts may become detached from the main body of coral by storms. 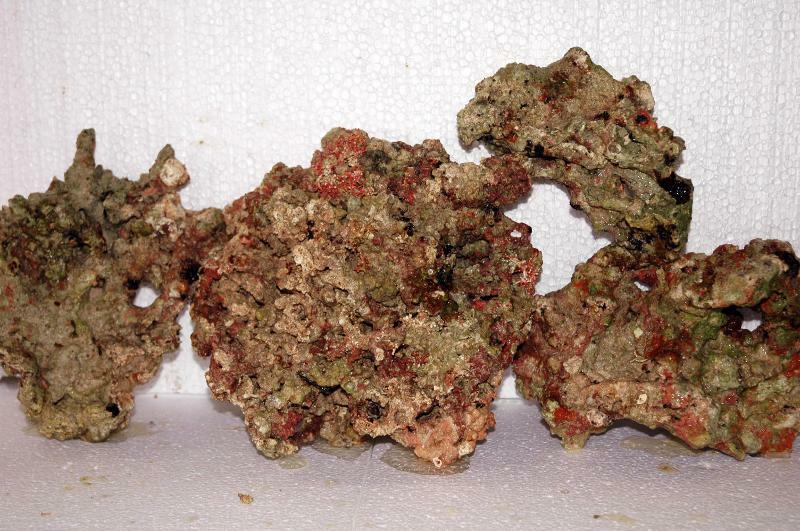 It may also be "seeded" from small coralline rocks by an aquaculturalist in warm ocean water, to be harvested later. Live rock can also be seeded by adding base rock to an active reef aquarium that already has live rock. Live rock harbors a wide variety of corals, algae, sponges, and other invertebrates, when they are collected. Corals added to the aquarium later will often become attached to the rock. For the aquarium trade this rock is highly valued not only for the diversity of life it can bring to the closed marine environment, but its function as a superior biological filter that hosts both aerobic and anaerobic nitrifying bacteria required for the nitrogen cycle that processes waste. Live rock becomes the main biological nitrification base or biological filter of a saltwater aquarium. Additionally, live rocks have a stabilizing effect on the water chemistry, in particular on helping to maintain constant pH by release of calcium carbonate. 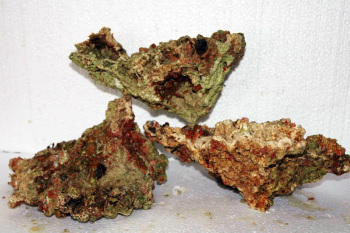 Lastly, live rock, especially when encrusted with multiple colors of coralline algae, becomes a major decorative element of the aquarium and provides shelter for the inhabitants. It is often used to build caves, arches, overhangs, or other structures in the tank, a practice known as aquascaping. We sell various types and sizes of base rock. We have a variety of base rock in stock and on sale. We carry Premium Fiji Live Rock. We also carry the "purple stuff". All varieties of Real Reef Live Rock & Caribsea Life Rock. Real Reef Rock for $5 per pound (sizes... small, medium, large, xl, xxl, branch $9/lb., shelf $6/lb.) & Caribsea Life Rock for $4 per pound, Belize Branch at $5 per pound.